Mark McNulty heads the Irish challenge after a blistering six under par 66 on day one of the MCB Tour Championship, the final event of the 2017 European Senior Tour season. The bogey-free assault on the Constance Belle Mare Plage track included three birdies on each nine and puts the 64-year-old in a three way tie for 2nd, just one shot off the lead. McNulty, who cracked the Official World Golf Rankings top-10 for 83 weeks between 1987 and 1992, was born in Zimbabwe but became an Irish citizen at the age of 50 in 2003. His grandmother was from Ballymena with Mark currently residing in England. Paul McGinley had a fine start to his challenge too, recovering from a mid-round double bogey to post a two under par 70. The former Ryder Cup Captain caught fire with three to play, a hat-trick of birdies propelling him into a tie for 13th, nicely placed ahead of a weekend charge. Just one shot further back lies Des Smyth who snuck into the red with an opening 71. Brendan McGovern will be hoping to cap off a fine season with a strong finish and he began with a quiet, no damage done 72, while Philip Walton had a day to forget – a four over par 76 sees him occupying second last position on the leaderboard in a tie for 48th. It was Australia’s Peter Fowler who took the spoils on day one, however, as he carded a season’s best seven under par round of 65 at the season finale. 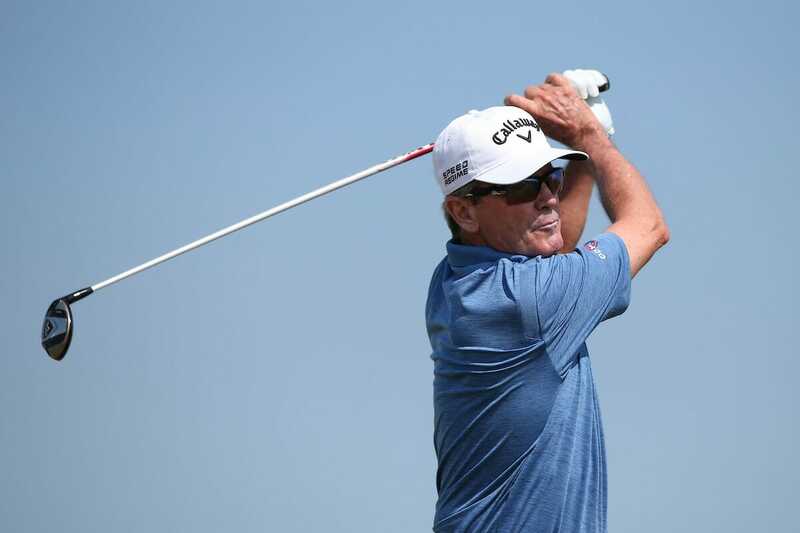 The 58-year-old, a former winner of the John Jacobs Trophy, arrived in Mauritius with an outside chance of topping the Order of Merit for the second time and birdied three of the last six holes to finish one stroke ahead of defending MCB Tour Championship winner Barry Lane, Mark McNulty and Thaworn Wiratchant, who each carded six under par rounds. Fowler started the day with four birdies on the first six holes, making the turn in 32, and his late flourish saw him take sole possession of first place. “I’m really pleased, that’s the best I’ve putted all year,” said Fowler. “I was happy with my rhythm around the course. I think you could shoot lower here, but it depends on how you’re rolling your putts on these grainy greens – it’s not easy. “It’s not a long course, but it’s tricky. The greens are small, and you have to be accurate both off the tee and into the greens. Lane, like McNulty, fired a bogey free round, the Englishman eagling the 18th hole to share second place. “The shot I hit into the last was magnificent,” said Lane. “I had 220 yards into the wind, and I told my caddie it was a perfect five wood, but I had to hit it perfect; thankfully I did and then I rolled the putt in. “I haven’t felt well today at all. I’ve got an awful cold, but you need to go out there and enjoy it. Order of Merit leader Clark Dennis shares fifth place with André Bossert after a four under par round of 68. Philip Golding, who has an outside chance of winning the John Jacobs Trophy, is one of six golfers in a share of seventh on three under par.